The new club kit has now been launched and items can be purchased direct from the club. If you want to be one of the first club members to wear our new kit, it should be available before Christmas, so we are taking orders now. 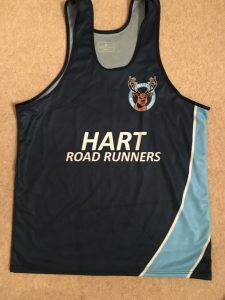 Initially, the kit will be available either as a Running Vest or a T Shirt, and both will be branded with our name and club logo to the design as shown on the images on this page. In due course, other items will be added to the catalogue for purchase. To buy your new kit visit the Shop noting the following. Items can be collected before our Tuesday or Thursday sessions – you can express a preference when you order. If you find that you have the wrong size, this can be changed upon collection, so please select a size that you believe will suit (suggest that you use your existing kit as a guide). 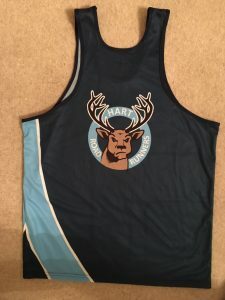 If you wish to add your name to the vest, you will need to arrange to have this printed yourself as per the existing arrangements. Prices are very competitive with the Running Vest costing £18.50, the T Shirt £19.70 and the Hoodie £21.